Universal Mind bills iBrainstorm, its free iPad app, as a “creative collaborative tool.” The productivity offering aims to replace the whiteboard—or at least move the whiteboard onto the iPad’s touchscreen. When iBrainstorm undergoes further upgrades, I might be able to get behind that vision. Until then, you'll want to stick with a physical whiteboard. Essentially, iBrainstorm turns an iPad screen into a drawing surface, one with a brownish hue. You use your finger as a black dry-erase felt-tip pen to make notes, draw, or scribble down whatever you want on the screen. To erase any portion of what you’ve drawn, just tap an eraser button at the top of the screen, and your finger switches from marker to eraser. Tapping another button at the top right of the screen erases everything in one blow. Take Note: iBrainstorm turns your iPad into a drawing surface where your finger becomes a black marker. 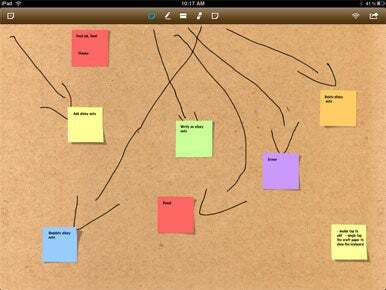 You can also add post-it notes to the screen either by yourself or from colleagues using the iBrainstorm Companion app. By tapping the plus button on the top left of your screen, you can add post-it notes to your canvas. You can move the post-its to anywhere on screen by dragging them with your finger. If you hold a finger down on a post-it note, a keyboard appears, allowing you to type on that note. A color palette on the top of the keyboard lets you change the color of the post-it. So what makes iBrainstorm collaborative? If up to four of your colleagues have the separate iBrainstorm Companion app on their iPhone or iPod touch, they all can contribute to the iPad whiteboard via a wireless connection. The iPhone app just shows a post-it note on the screen. Using iBrainstorm Companion, you can write suggestions on an electronic post-it note; you then flick that note upward off screen to make it appear on the iPad version of iBrainstorm. The main iPad user can move that post-it to anywhere on the screen, changing the note’s color as to identify who wrote it. It’s a pretty impressive way to collaborate between devices. Still, iBrainstorm suffers from a few shortcomings. The iPad app won’t allow you to change the size of your felt-tip pen, or post-it note font sizes, making it hard for multiple people to see everything on the iPad’s screen clearly without having to crowd around it. (After all, as nice as the iPad’s screen is, it’s a lot smaller than most whiteboards.) If your colleagues can’t see the screen, how are they expected to contribute to it? iBrainstorm lets you collaborate in other ways by allowing you to e-mail any image you create during a brainstorming session. Colleagues can look over your work and send back suggestions, but they can’t modify the image you send them. Perhaps my greatest frustration with iBrainstorm stems from the fact that once you save your work, you can’t modify it. The last project you worked on in iBrainstorm will always come up on screen when you launch the app. You can modify that work to your heart’s content, but if you want to start a new project, you have to save your current work and give up the ability to ever change it. I would prefer to ability to open another iBrainstorm window and work on two projects side by side. iBrainstorm works as advertised, and the ability to send contributions from an iPhone to an iPad during brainstorming sessions certainly impresses. But if the app is to truly deliver on its promise of collaboration, it will need to add more features and flexibility.